YEREVAN, January 14. /TASS/. Acting Deputy Prime Minister Ararat Mirzoyan was elected Speaker of the 7th National Assembly (parliament) of Armenia on Monday, TASS reported from the parliamentary chamber. "Deputy from the bloc ‘My Step’ Ararat Mirzoyan was elected by 131 votes as Speaker of the National Assembly of Armenia," chairman of the counting board Vaagn Ovakimyan reported. 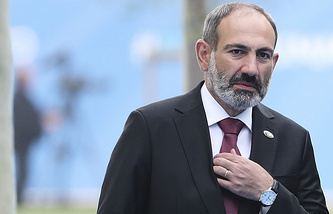 After Nikol Pashinyan’s election as prime minister in May 2018, Mirzoyan was appointed to the position of the republic’s deputy prime minister. On Monday, he was promoted by the ruling bloc "My Step" to the post of parliamentary speaker. Mirzoyan, 40, is a candidate of historical sciences. He is a founder and member of the Civil Contract party and a leader of the My Step movement which carried out a revolution in Armenia.